Perhaps the most beautiful house on Lake Constance, the “House of Cavazzen” stands on Lindau’s Marktplatz. With its huge hipped roof and wonderful painted facades, this splendid Baroque house is one of Lindau’s most striking buildings and is also home to Lindau’s Municipal Museum. This Baroque gem was the work of Swiss architect Jakob Grubenmann, who built it in 1728-29 after a fire destroyed much of the town. The beautifully painted facades and unusual sweeping roof are a masterpiece of the builder’s art at that time. Art historian Georg Dehio described it as “one of the most beautiful Baroque town houses in the Lake Constance region”. The name Cavazzen probably comes from the “de Kawatz” family, who lived on this spot in the 16th century after moving from Lombardy. This palazzo has been the home of Lindau’s town museum since 1929. The permanent exhibition extends over the building’s three upper floors. It takes visitors on a journey through the history of Lindau through a wide range of exhibits, including furniture from the late Gothic to the Art Nouveau periods, historic weaponry, paintings and sculptures from the 15th to 19th centuries and much more. A particular highlight is the unique collection of mechanical musical instruments, from little musical boxes to barrel organs and huge instruments that imitate the sound of a whole orchestra. 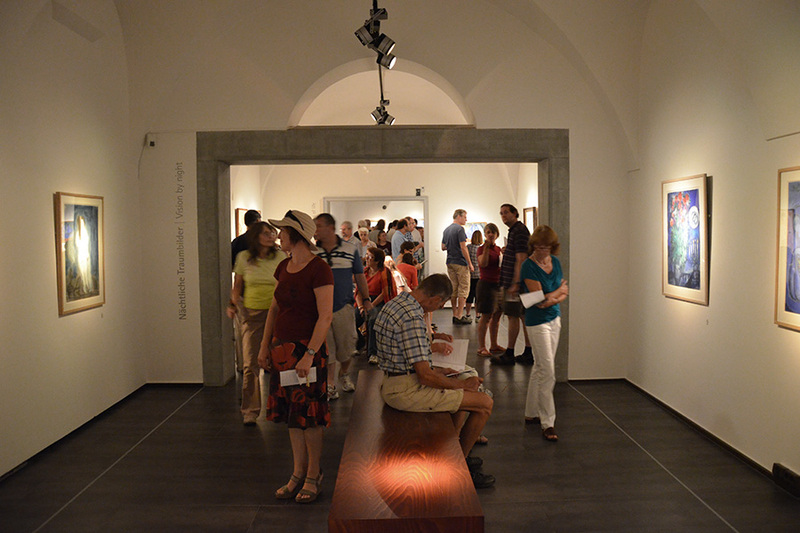 From April to October the “Cavazzen” also hosts some first-class temporary exhibitions. After Picasso, Chagall, Miró, Matisse, Nolde and Klee in 2017 the museum will show the works of Augst Macke in 2018. It also holds a regular programme of readings and vernissages. Young visitors aged six and above can enjoy special tours and children’s programmes. In summer, the Mediterranean courtyard with its fountain of Melusina is a wonderful shady place to sit and rest. It is also home to Il Cavazzo, the museum cafe, which serves guests during the special exhibitions that are held between April and September.